When Dan Gorlin wrote Choplifter! in 1986, connecting a joystick to a personal computer was a relatively new idea., A big fan of the coin-op arcade game Defender, Dan decided it would be a good idea to let the player save people as well.Gorlin was a seasoned programmer writing AI code for the Rand Corporation, and wanted to build a 3D helicopter simulator program, but quickly realized the limited power of the Apple II computer he had borrowed was not capable. Our new game, in partnership with Big John Games, takes that idea one step closer, while being faithful to the original game. The Nintendo 3DS is still the only 3D display available to anyone for less than $200, and it doesn’t require any special glasses! 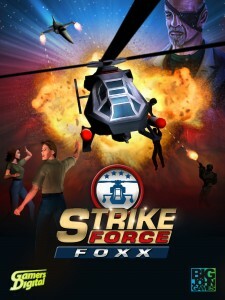 Strike Force Foxx has all the fast-paced arcade action of a class game, with the power of 3D graphics. We can’t wait for you to see it!